You can use smart tags in Visual Studio to quickly implement an interface for a class. 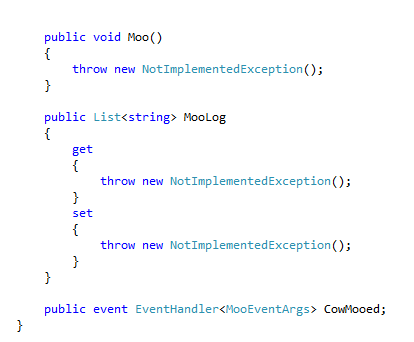 For example, let’s say that you want to add code to the Cow class to implement the IMoo interface. You start by updating the class declaration to derive from IMoo. If you now hover over the little underline under IMoo, you’ll see a smart tag. If you click on the smart tag, you’ll see two options. Click on “Implement interface ‘iMoo’ “. Empty implementations of all of the interface’s members will be automatically added to the class. (Note that the methods throw NotImplementedException exceptions by default).